The hot section of an operating turbine is one of the more complicated flow environments associated with any practical machine; the flow is always unsteady, it may be transonic, it is three dimensional, and it is subject to strong body forces. Further, the interaction of these factors means that to obtain realistic information about the flow behavior inside an engine, all of these factors must be replicated. 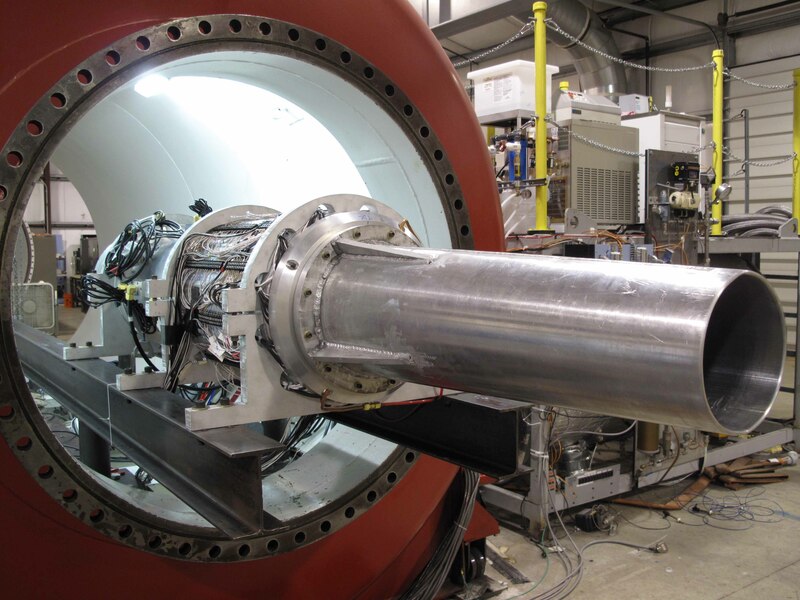 The Turbine Test Facility (TTF) is a short-duration facility designed to do just that. It is capable of matching stage pressure ratio, flow function, corrected speed, Mach number, Reynolds number, and other important non-dimensional parameters--both with and without cooling flows. The Turbine Test Facility was designed and constructed at the Calspan Corporation in 1983 to produce conditions representative of the inlet to a turbine stage. 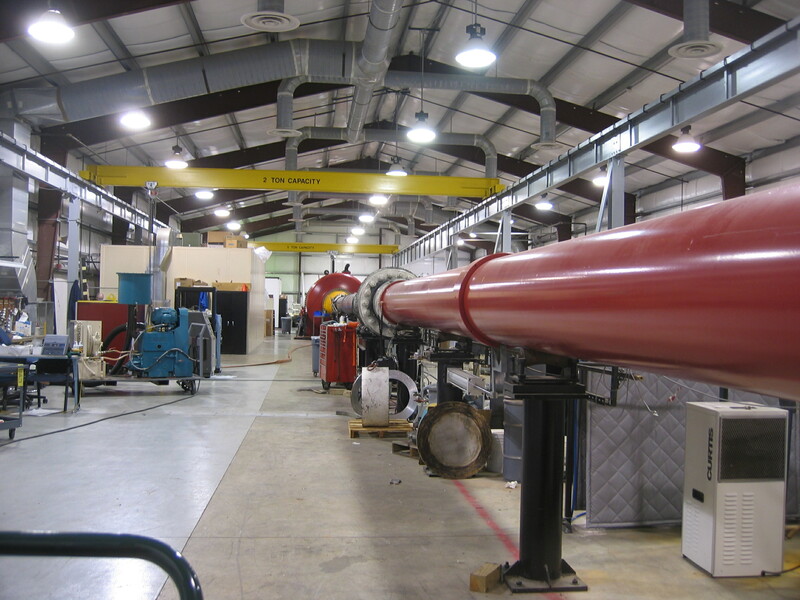 In 1995, the researchers who designed, constructed, and operated this facility moved to The Ohio State University to form the Gas Turbine Laboratory (GTL), and they purchased the facility from Calspan. It now resides in the 12,000 square foot GTL at the Ohio State University Airport in Columbus, Ohio. The TTF consists of a 100 foot long shock tunnel attached to a 32 foot long by 9 foot diameter dump tank in which the turbine rig is mounted. It can operate in either shock or blowdown mode depending on the test conditions needed. Shock tunnel mode creates the appropriate temperature and velocity conditions, while blowdown mode only generates the desired velocity. A full-scale turbine rig is mounted inside the dump tank. These rigs are built using real engine hardware and are heavily instrumented. High-speed data is collected on the fixed shrouds and stators as well as the rotating blades to provide a good characterization of the unsteady effects that are a critical part of any engine's operation. Past experimental programs have included pressure, temperature (static and total), heat flux, and strain measurements. In addition, rotational encoders are used to precisely track the speed of the rotor. The rotor's acceleration can then be combined with its rotational inertia to provide aeroperformance measurements. Data produced using the TTF at Calspan and at Ohio State has been instrumental in developing industry understanding of the flow physics of an uncooled turbine and the computational fluid dynamics codes used to model them. In 2006, Tallman et. al, came to the conclusion that computational codes had reached the point they were able to accurately predict uncooled flows and the data available was sufficient for further refinement and ready to tackle the added complexity of film-cooled turbines(GT2006-90927). Significant changes were required to prepare the TTF for film-cooled experiments including the integration of a coolant supply, the construction of a large combustor emulator to heat the gas even in blowdown mode, the development of advanced instrumentation, and the expansion of the Main Data Acquisition System. The GTL ran the first experiments using a fully film-cooled stage operating at design corrected conditions in 2005. The results of these experiments as well as further discussion of the facility improvements are published in GT2006-90966 and GT2006-90968. Much was learned about how to run film-cooled design-corrected experiments, and these lessons have been applied to subsequent research programs. Since those initial experiments, measurement programs have been performed for three additional cooled turbines, and a fourth turbine is under development. Comparisons with CFD have shown that the introduction of cooling makes the prediction of fluid temperature and heat-flux much more difficult. This is due in part to the multi-scale nature of cooling simulations, since the CFD must capture the large scale unsteady flow features as well as their interactions with hundreds of small cooling jets. In addition, cooled experiments introduce new challenges in determining the appropriate boundary conditions and require much more detailed measurements.